Potassium plays a lead role in: enzyme activity, photosynthesis, respiration, carbohydrate production, translocation, and transformation, Nitrogen metabolism and protein synthesis, as well as controlling the uptake of certain micronutrients. Potassium attributes include: root growth and drought, heat, cold, and wear tolerance. Nitrogen fertilization of turf grass creates the greatest demand for potassium as compared to other turf nutrient requirements. Potassium is one of the greatest investments for good turf management programs. It has the ability to strengthen the plant, by making plant cells thicker, and is involved in over 60 enzyme systems that regulate plant growth. One of these major roles is in regulating water use efficiency in turf grass. The opening and closing of stomates (microscopic openings or pores) is directly related to the concentration of potassium in the cells that surround the stomates. If turf grass has a shortage of potassium, the stomates will only partially open and be slower in closing. Potassium is also vital in photosynthesis. If turf grass is deficient in potassium, photosynthesis will decline, which will in turn increase the respiration rate. This deficiency will then cause a decrease in supply of carbohydrates which provide energy for the plant growth. While potassium is found in the soil solution, much of it is relatively unavailable. Optimum availability of potassium is at a soil pH of 6.0-7.0 and is relatively immobile in the soil. It is dependent upon soil moisture to move into the plant so dry conditions can be limiting to potassium availability. Management of potassium, and other essential nutrients, is part of a balanced fertility program for turf. 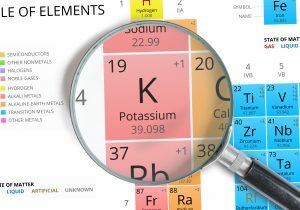 Potassium (K) is a primary plant nutrient that plays a major role in healthy turf. Turf grass varieties require potassium in large amounts, second only to nitrogen (N). Unlike nitrogen, visual turf response to potassium is not frequently observed.